There are various ways to cut ceramic tiles. 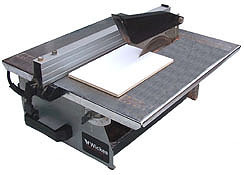 Generally speaking the bigger and heavier the tile is then the bigger and better quality the cutter you will need. The hardest thing to cut tend to be thick floor tiles (like quarry tiles). A cheap but basic method. Use the scribe and a straight edge as a guide to scratch a straight line in the tile. Then use the hand cutter to break the tile in two down this line. I wouldn't recommend this for heavy tiles or a big job. But can be fine if you just want to cut and fit a few small light weight wall tiles. This essentially cuts the tile in similar way to the above but it's much more effective and will cut large heavy tiles especially if you buy a large good quality one. Lay the tile on the bed and push the scribe over the tile which it does with a perfect straight line, then put the tile in the cutting jaw and press down on the lever to cut the tile in two. Some of these cutters will also do diagonal cuts, some don't . Check before you buy if you need to. These used to be used only by professionals but are now widely available at low cost. They give effortless cutting but are a little noisy. They can also be a bit messy as you need to keep the cutting disk cool in a water trough. A useful tool for cutting difficult shapes. It's a bit like a hacksaw but has a special blade for cutting tiles. NB you can buy these blades to fit you junior hacksaw. For cutting difficult shapes or to tidy up edges. Use these to nibble away at the edge from the tile taking small pieces off at a time.